Ferritic bainitic steels are also known as FB steels. These steels are one of the types of advanced high strength steels which have been developed for automotive application. Since these steels have two phases, hence these steels are also a type of dual phase (DP) steel. FB steels are mostly available as hot rolled products. These steels are normally cold-drawn. Ferritic bainitic range of hot rolled high strength steels has been developed to meet weight reduction requirements of the automobiles. . They are fully killed steels and are usually available in four strength levels namely FB 450, FB 540, FB 560 and FB 590. FB family of steels extends the HSLA range of micro alloyed steels to include products combining high ultimate tensile strength (UTS) with excellent formability. Typical additions for grain refinement in these steels are Al (aluminum), B (boron), Nb (niobium), and Ti (titanium). These elements are added individually or in combination. Nitrogen (N) binding is also used sometimes. FB steels are with soft ferrite and hard bainite. They have a microstructure of fine ferrite and bainite. Their micro structure is finer than the typical DP steel. Strengthening is obtained by both grain refinement and second phase hardening with bainite. The micro structure of FB steels gives these steels a marked improved ductility. 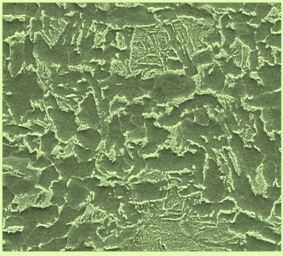 Fig 1 shows a typical microstructure for the FB steel. FB steels are utilized to meet specific customer application requirements that require stretch flangeable (SF) or high hole expansion (HHE) capabilities for improved edge stretch capability. SF capabilities of FB steels are based on their ferrite bainite micro structure. The micro structure is usually even more finely tuned to be SF. This characteristic can be measured by the hole expansion test and gives FB steels the ability to resist stretching on blanked edge. The primary advantage of FB steels over high strength and low alloy (HSLA) and DP steels is the improved stretchability of sheared edges as measured by the hole expansion test (?). Compared to HSLA steels with the same level of strength, FB steels have a higher strain hardening exponent (n-value) and increased total elongation. Besides having high strengths and good SF or HHE capabilities, other important properties of FB steels are given below. Despite high strength, FB steels display generally good cold formability. The graph at Fig 2 gives critical forming limits calculated for the FB family of steels in 2.5 mm thickness. FB steels display high work hardening even at slight strains. FB steels have good weldability. They can be welded to common steel grades or other FB steels. The welding parameters must be matched to the material. For spot welding FB steels same equipment as used in the unalloyed deep drawing steels can be used. However the electrode forces should be increased slightly to achieve a large welding current range. When spot welding FB steels the use of sturdy welding tongs with plenty of force reserves is needed. Increase in welding time also has a favorable effect on the welding current range. Because of their good weldability, FB steels are considered for tailored blank applications. Compares with deep drawing steels, FB steels tend to have lower electrical conductivity. Hence these steels need lower welding currents with the same electrode force in the spot welding. FB steels have bake-hardening properties. After bake hardening at a temperature of 170 deg C and a holding time of 20 minutes, bake values of greater than 30 MPa are achieved. FB steels are characterized by good crash performances. FB steels have good fatigue properties. These steels are good in dynamic loading conditions and can carry vibration loads. 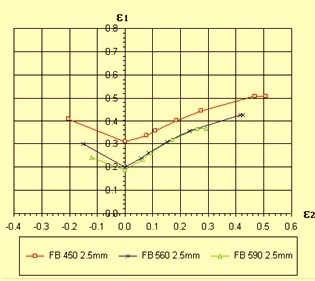 Examples of Wohler curves for a variety of FB steels are given in the Fig 3 below. 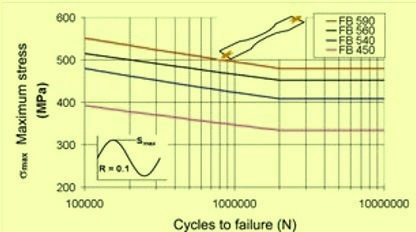 The curves plot maximum stress versus number of cycles to failure. They are calculated for a tension-tension loading ratio of R = 0.1. FB steel performs well under dynamic loading conditions, making it well suited to carry vibration loads. The stretchability of FB steels at sheared edges makes it an excellent choice for tailored blank applications. Often cold drawn FB steels are used for the following applications. Safety critical parts such as pillars, rails, beams, chassis and chassis parts, and bumpers etc. Since FB steels have good fatigue properties in dynamic load conditions, they are outstanding materials for shock towers and control arms. FB 450 grades find application for rim, brake pedal arm, seat cross member, and suspension arm etc. while FB 590 grades find application for lower control arm, rim, bumper beam, chassis parts, and rear twist beam etc.